The alignment grid aligns fields and text within report headings and footings with precision. You can align text and fields in all types of headings and footings (report heading/footing, page heading/footing, and subheading/subfooting). Alignment grid is supported for reports in HTML, PDF, Excel 2000, and Excel 2007 output formats. The alignment grid appears as a dotted grid line around each individual item in a heading or footing and shows how these items actually appear in your report output. Using the alignment grid and Alignment Properties, you can justify items, select item width, select decimal alignment, and add and remove items. Items refer to the cells in the grid. The following image shows a portion of Report Painter with a report that has alignment grids in the Page Heading and Subheadings. Click in the heading or footing where you want to add alignment. Have items (text or fields) in your heading or footing, a grid appears around each of the items in your heading or footing. Skip to Step 4. Do not have items in your heading or footing, the Insert Alignment Grid dialog box opens. Select the number of lines, the number of items per line, the default item width, and the justification or decimal alignment, and click OK. Note: You can change these properties at any time. Right-click an item in the heading or footing and select from the alignment options. Options include Grid Options, Cell Options, Clear, Select All, Delete All, Insert, Delete, Alignment Properties, and Merge. Note: For a complete description of alignment options, see Alignment Grid Options. Item width. You can also adjust the item width by dragging the vertical cell wall with your mouse. Double-click the embedded field in the page heading, page footing, subheading, or subfooting to highlight it. Right-click the highlighted embedded field and select Alignment Grid. The alignment grid appears as a dotted grid line around each individual item in the heading or footing. Note: A tooltip appears when the mouse is hovered over the embedded value. Click anywhere in the alignment grid and select Alignment Properties from the Properties menu. The Alignment Properties dialog box opens. Style the embedded field with the alignment grid options. For more information, see Alignment Grid Options. To add or edit text in an existing item, double-click the item and type or style the text or field. To add a field to an item, drag and drop the field from the Fields List or activate the item and double-click the field in the Fields List. To edit the width and justification of items in a grid, right-click the item and select Alignment Properties. Adjust the properties and click OK.
Use the Undo and Redo buttons in Report Painter to undo and redo changes. You can move or copy an item using your mouse or keyboard. Select the item(s) and place your mouse anywhere on the black border. The cursor changes to a four-way arrow. Click and drag the items to move the selected items. Hold down the Ctrl key and click and drag to copy the selected items. Right-click and drag presents you with the option of moving, copying, or canceling. Select the item (you see a black border around the item or items when they are selected). Copy selected items using the Ctrl+C (copy) and Ctrl+V (paste) keys on your keyboard. Move items using the Ctrl+X (cut) and Ctrl+V (paste) keys on your keyboard. Note: Only contiguous selections of items can be moved or copied. Select the text or field and press the Delete key. Deleting text and fields in an item with the Delete key will not delete the item. An item or line, right-click the item or line and click Delete Item or Delete Line. The entire grid, right-click the grid or an item in the grid and select Delete All. The following shortcut keys are supported when using the Alignment Grid. The first column provides the action and the second column provides the key combination. Although the alignment grid is supported for reports in HTML, PDF, Excel 2000, and Excel 2007 output formats, Grid Options and Cell Options may vary, depending on the report output. Selecting multiple cells while applying styling options with the Report Painter toolbar applies only the styling you changed to the selected cells. Selecting multiple cells while applying styling options with the Report Options dialog box applies the styling to all of the selected cells. You cannot add a field to a group of text. Adding a field to a line automatically breaks the line and the field is added as its own item. When you drop a field at the end of a line, a new item is created at the end of the line. When a line becomes too wide to fit on the given page size (PDF), the line is truncated. If embedding a field name from the Fields window of the Object Inspector in a heading or footing, a tooltip appears when the mouse is hovered over the embedded value in the alignment grid of the Report Painter window. When the alignment grid is enabled in Report Painter, additional alignment grid options are accessible from the Properties menu or from the right-click context menu in Report Painter. The alignment grid options include Grid Options, Cell Options, Alignment Properties, and Merge options. To enable the alignment grid, click Alignment Grid from the Properties menu or select Alignment Grid from the right-click context menu within a heading or footing. The alignment grid appears as a dotted grid line around each individual item in a heading or footing. The following image shows the alignment grid options from the Properties menu in Report Painter. The following image shows the same alignment grid options from the right-click context menu of a heading or footing. Opens the Properties dialog box for the heading or footing at the Style tab. Note: Although the alignment grid is supported for reports in HTML, PDF, Excel 2000, and Excel 2007 output formats, Grid Options may vary depending on the report output. Note: Although the alignment grid is supported for reports in HTML and PDF output formats, Cell Options may vary depending on the report output. Select from the Clear submenu to clear formats or contents for the item in the alignment grid. Clear Formats removes all formatting and styling for the item. Clear Contents deletes all text and fields within the item. Selects all items in the grid. Deletes all items and removes the alignment grid. 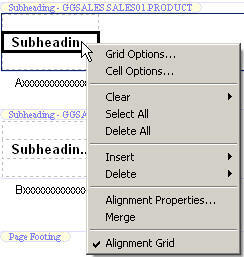 Select from the Insert submenu to insert items and lines in the alignment grid. Insert Item to the Left inserts a new item to the left of the current item. Insert Item to the Right inserts a new item to the right of the current item. Insert Line Above inserts a grid line above the current item, using the same format and number of items as the current line. Insert Line Below inserts a grid line below the current item, using the same format and number of items as the current line. Select from the Delete submenu to delete items and lines in the alignment grid. Delete Item deletes the selected items. Delete Line deletes the entire line associated with the current item(s) selected. Opens the Alignment Properties dialog box. The following image shows the Alignment Properties dialog box with the default options. Enter the width between the selected items. The default is one inch between items. Select the justification for the alignment grid. Options are left, center, or right. Left is the default justification. Decimal alignment specifies how far in from the right side of a column you want to place your decimal point. With this specification, you can locate the decimal point in the same position within a column, regardless of the number of decimal places displayed to its right. The measurement will be a portion of the width you have specified for this item. Note: The Decimal alignment option is disabled when Justification is selected. Merges selected horizontal items into one cell in the alignment grid. Alignment grid shows or hides the grid. Click Alignment Grid from the Properties menu. Click Alignment Grid from the right-click context menu within an empty heading or footing object. The Insert Alignment Grid dialog box opens, as shown in the following image. The Align with Data option automatically aligns the alignment grid with the data columns in the report. This option is automatically selected for Excel 2000 and Excel 2007 output formats. Note: For PDF and HTML output formats, selecting Align with Data disables the Number of items per line and Default item width options. Enter the number of lines to be created for the alignment grid. The default is 3 lines. Enter the number of items, or cells, to be created for the alignment grid. The default is 4 items per line. Enter the default width between all cells. The default is one inch between items. Select the default justification for the alignment grid. Options are left, center, or right. Left is the default justification. Note: The Decimal alignment option is disabled when Default justification is selected. Click OK to close the Insert Alignment Grid dialog box. The alignment grid appears as a dotted grid line within the heading or footing object. The additional alignment grid options are accessible from the Properties menu or from the right-click context menu of the heading or footing object in Report Painter. When using a heading or footing in Report Painter and enabling the Alignment Grid, you can align your border settings to the headings and footings with Grid Options and Cell Options. Alignment grid is supported for reports in HTML, PDF, Excel 2000, and Excel 2007 output formats and aligns fields, text, and borders within report headings and footings with precision. With Alignment Grid enabled, Grid Options and Cell Options provide further styling options for the alignment items. Items refer to the cells in the grid. Align the heading and footing with data in the report. Create borders for the entire alignment grid or for all cells within the grid. Set borders for a selected cell in the alignment grid. Span columns for the cell and set the align object options for the cell. Note: You can align text, fields, and borders in all types of headings and footings (Report Heading and Footing, Page Heading and Footing, and Subheading and Subfooting). The Align with Data option automatically aligns the alignment grid with the data columns in a PDF or HTML report. In Report Painter, create a PDF, HTML, Excel 2000, or Excel 2007 report containing a heading or footing, with text or fields, and click where you want to add alignment. Note: You can also select Alignment Grid from the right-click context menu within a heading or footing. The alignment grid appears as a dotted grid line around each individual item in a heading or footing and shows how these items actually appear in your report output. Right-click an item in the heading or footing and select Grid Options from the context menu. The Properties dialog box opens for the heading or footing at the Style tab. 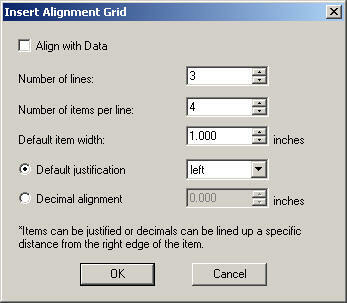 Select the Align with Data check box, as shown in the following image. Note: Enabling the Align with Data option overrides any justify settings that are set from the Font toolbar (Left Justify, Center Justify, Right Justify, or Default Justify). The Align with Data check box is not available for Excel 2000 and Excel 2007 formats. 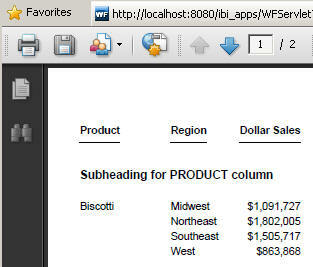 The following image shows a PDF report with a subheading for the Product column with Center Justify. 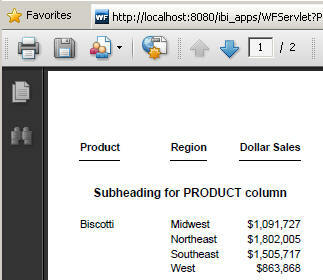 The following image shows the same PDF report with the Align with Data option enabled. Note how the subheading aligns with the data column. To create borders for the entire alignment grid or for all the cells within the grid, enable the Border all cells in the grid option. In Report Painter, create a report containing a heading or footing, with text or fields, and click where you want to add alignment. Right-click an item in the heading or footing and click Grid Options from the context menu. Click the Select Borders button. The Borders dialog box opens. By default, the Make all borders the same option is selected. Optionally, you may specify border settings for the top, bottom, left, and right borders, or keep the default settings. Click the Border all cells in the grid check box. Note: This option is off by default, as shown in the following image. This creates borders for the entire alignment grid. If Make all borders the same option is unchecked, the border options are applied only for the cells within the grid. 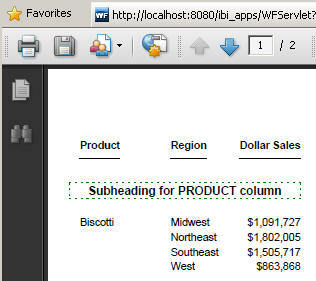 Optionally, select Align borders with data to automatically align the grid with the data columns in the PDF report. This option is off by default. Click OK to close the Borders dialog box. The border options appear in the Report Painter window. The following image shows a PDF report with a subheading for the Product column with border settings for all the cells within the alignment grid. You may set the border for a selected cell in the alignment grid with the Cell Options. In Report Painter, create a PDF report containing a heading or footing, with text or fields, and click where you want to add alignment. Select Alignment Grid from the Properties menu. Right-click the item in the heading or footing and select Cell Options from the context menu. The Borders dialog box opens. By default, the Make all borders the same option is selected. OFF to turn borders off. LIGHT to apply thin border lines. MEDIUM to apply medium border lines. HEAVY to apply thick border lines. Click the down arrow in the Style drop-down list box and select a line style. Click the down arrow in the Color drop-down list and select a color. 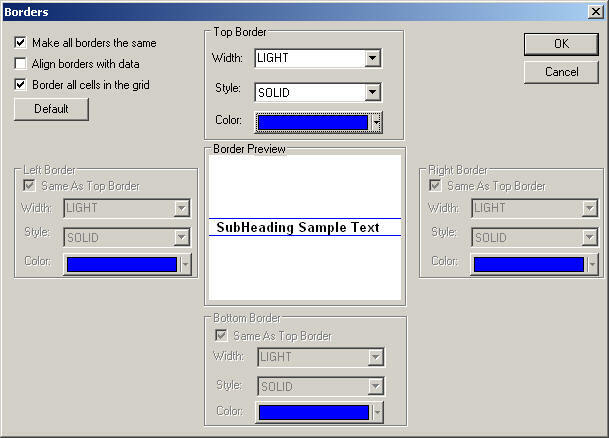 The following image shows the Borders dialog box for Cell Options for a PDF report. 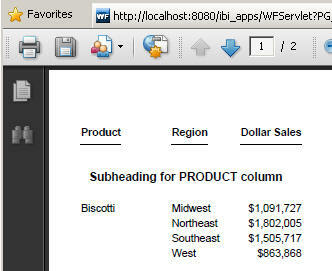 Optionally, select Align borders with data to automatically align the cell with the data columns in the PDF report. This option is off by default. This creates borders for the selected cell in the alignment grid. The following image shows a PDF report with a subheading for the Product column with border settings for the cell in the alignment grid. You may span columns and set the align object options for the selected cell in the alignment grid with the Cell Options. This option is available for a PDF or HTML report. In Report Painter, create a PDF or HTML report containing a heading or footing, with text or fields, and click where you want to add alignment. Right-click an item in the heading or footing and select Cell Options from the context menu. Click the Span Columns button. The Align Object dialog box opens. To specify how many data columns the selected cell should span, enter the number of columns. Note: The default cell spans one column. Select the justification for the selected cell data. Options are Left, Right, or Center. Left is the default justification for the span column cell data. 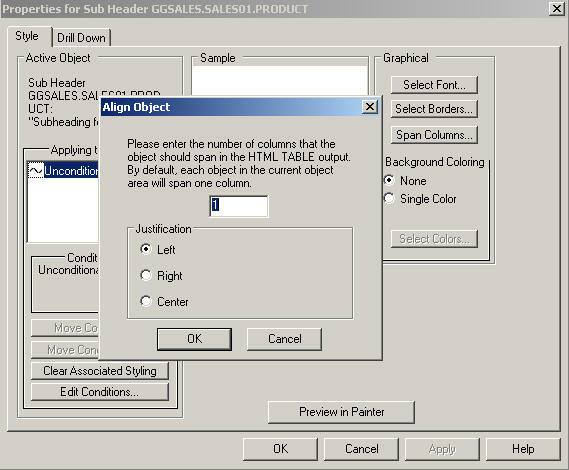 The following image shows the Align Object dialog box with the default selections for span column. Click OK to close the Align Object dialog box. The following image shows a PDF report with a subheading for the Product column with the default span columns settings. The selected cell spans one column and is left-justified. The following image shows the same PDF report with the align object options set to span three columns and is center-justified. You can align decimal points when the data being displayed has varying numbers of decimal places. The ability to align heading content in a multi-line heading based on width and justification values has special benefit in reports that contain data with different numbers of decimal places. For example, if a figure is in dollars, it is formatted with a decimal point and two places for zeroes. If in Swiss Francs, it is formatted with a decimal place and four zeroes and if in Yen, the decimal is at the end with no zeroes. In addition, sometimes the currency does not vary, but the number of digits of decimal precision varies. You can also use the Alignment Grid to align decimals in headings and footings with precision. For more information, see Aligning Fields and Text in Headings and Footings. By aligning the decimal points in a vertical stack, you can more easily read and compare numbers. The technique uses a width specification for the item that contains decimals, combined with a variation on standard left/right/center justification to achieve the proper decimal alignment. For more information, see Using Headings, Footings, Titles, and Labels in the Creating Reports With WebFOCUS Language manual. Identify the maximum number of characters in a field. You can refer to the format specification in the Master File or in a command, such as a DEFINE to determine the number. Right-click the embedded field in the page heading, page footing, subheading, or subfooting and select Alignment Grid. Right-click the embedded field within the alignment grid and click Alignment Properties. In the Item width field, enter the width between the selected items. This is the width of the maximum number of field characters you determined in step 1. 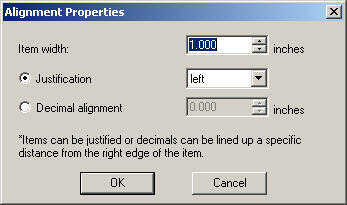 Specify the distance from the right end of the item for the Decimal Alignment. The measurement will be a portion of the width you have specified for this item. For more information, see Using Headings, Footings, Titles, and Labels in the Creating Reports With WebFOCUS Language manual. Click OK to close the Alignment Properties dialog box.